Potion Blue Cadet is a perfume by Dsquared² for men and was released in 2013. The scent is fresh-citrusy. It was last marketed by ITF Cosmetics. In mythology and literature, a potion is usually made by a magician, dragon, fairy or witch and has magical properties. It is used for various motives including the healing, bewitching or poisoning of people. For example, love potions for those who wish to fall in love with another, sleeping potions to cause long-term or eternal sleep, and elixirs to heal/cure any wound/malady. Potion Blue Cadet is a decisive spring and summer elixir, is an intoxicating blend of citrus and woody tones, powerful as the magical energy of the air, and dangerous as the highly poisonous herbaceous hemlock plant. The name Blue Cadet is not a case... blue like the brightness of the sky, and its serenity, quiet, harmony. Cadet because it is the blue adopted by the cadets, which expresses all their strength given by education to discipline and pride of belonging to a group. This potion is bottled in a transparent bottle that carries in itself the inspiration of the sapphire blue sky, with its immensity and endless depth. 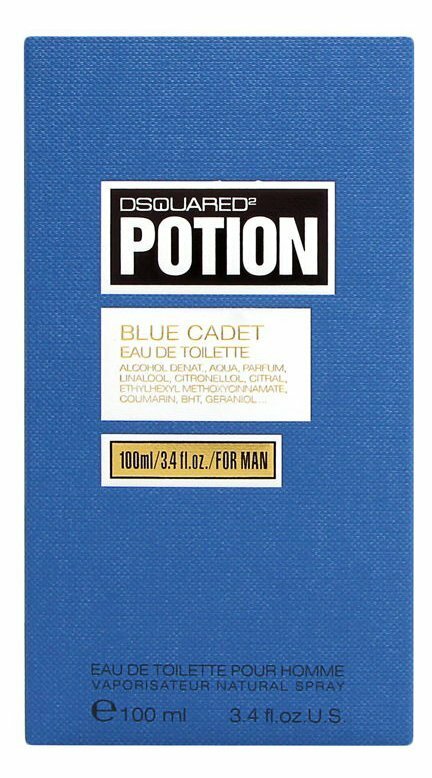 That being said, Potion Blue Cadet is a deviation in DSquared2’s fragrance aesthetic, for men at least. Usually, they are centered around woods — warm and pungent (He Wood Rocky Mountain Wood, He Wood Silver Wind Wood) or cool and aquatic (He Wood, He Wood Ocean Wet Wood, He Wood Cologne). Potion for Men falls into the first category and it goes on smelling like a cinnamon cookie, its spiciness enlivened with a drop of mint and perhaps a squirt of Angelica. Rather, Potion Blue Cadet is, not a flanker of Potion and well, blue, and a cadet is almost always young…and active. I expected Potion Blue Cadet to be a sports fragrance, and I was correct. I was also expecting to hate it, thinking about yet another aquatic…but I don’t. We’re all familiar with “formulas” and “classic” combinations. Using the classic formula of a sport fragrance — citrus, some invigorating/menthol-like element and light musk — DSquared2 "exchanged" some of the ingredients, replacing standard sport-fragrance bergamot with strong “pink” grapefruit, which is sweet but not “sweaty”, using blue hemlock with a pleasant green-pine aroma instead of salty, ambergris or Calone, and adding a diffuse, almost-powdery white cedar and tonka accord in place of a blatantly synthetic wood-musk mixture. Potion Blue Cadet has a masculine aroma inspired by the times where infusions of flower and plant aromas made by the master alchemists were considered powerful sources to enrich and strengthen the spirit of victory. Potion Blue opens up with rousing and citrus notes, bringing all vibrant energy with touches of bergamot, pink grapefruit, and mandarin. This mix is not an ordinary citrus like a classic cologne, there is a resinous note that gracefully blends with the zesty accord and keeps the opening brisk and clean. There’s a youthfulness to the citrus notes off the top. Slowly, the citrus aroma calms down and lets a more greenish heart made up of hemlock notes and spruce balm to kicks in. I don't think I have any other cologne in my wardrobe containing hemlock, the Devil's Beard, so to me, this heart aroma is pretty unique and so addictive. The white cedarwood and the pine leaves keep the heart balmy and airy as if you take a deep breath in a Canadian forest. However, it is the balsam fir note that really makes an impression. Finally, the woody notes that give the tone of the fragrance are revealed, in a harmonious combination of cistus, musk, and the exotic tonka fava. The drydown is warm and woody, a bit animal and a tad sweet. Its woody redolence is a true magic elixir that transports you to a different universe, where calm and serenity live in the most perfect harmony. 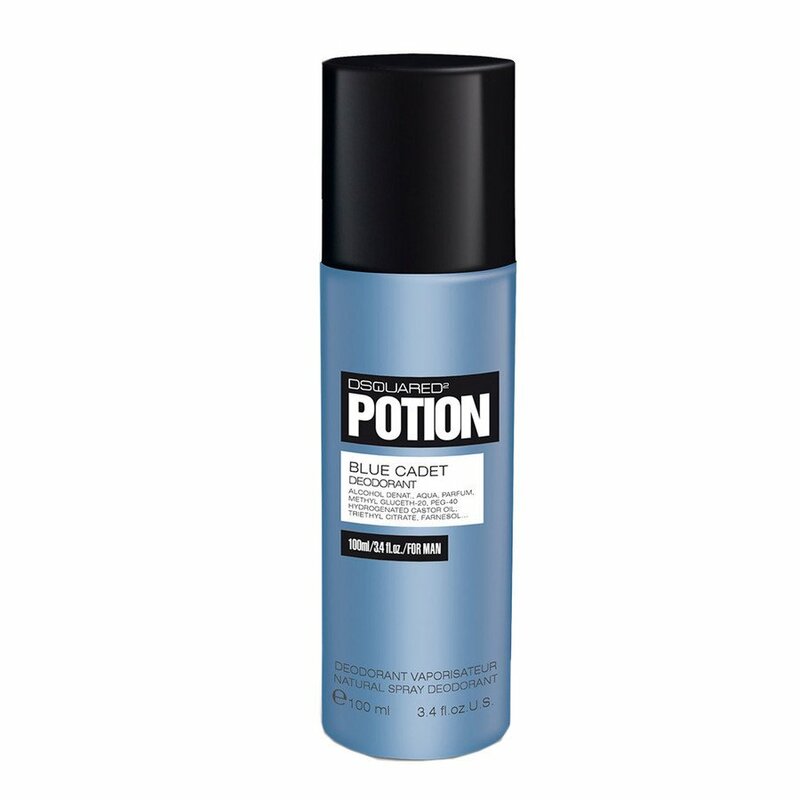 Potion Blue Cadet is brisk, fresh and clean, but not banal or dull. Best of all, it doesn’t smell like a laundry room redolent of scented detergent, fabric softeners and/or dryer sheets. 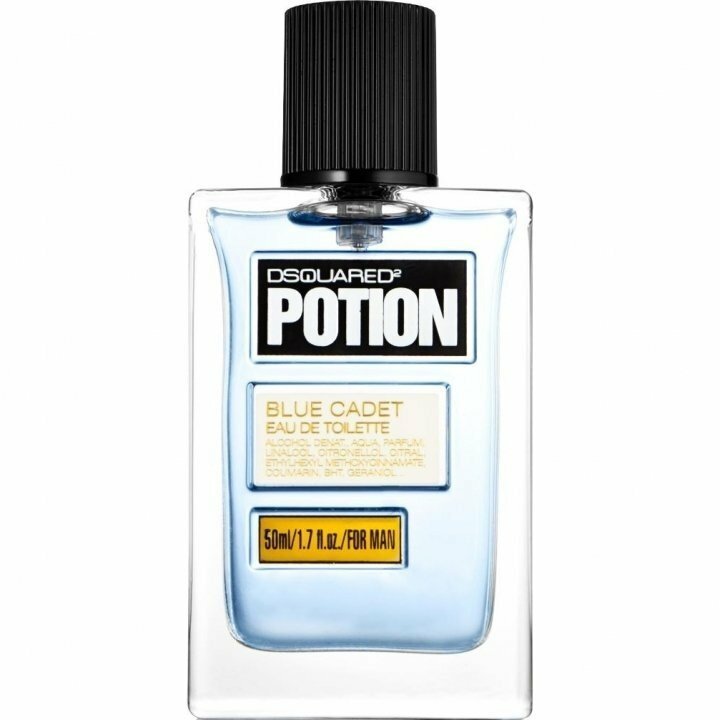 This is one of the nicer sports fragrances I’ve smelled and worn, and not one person who knows me said: “That smells cheap.” If you like sports fragrances, give Potion Blue Cadet a try, on my skin it has all-day lasting power and just-right sillage. Due to its moderate longevity and sillage, the cologne can be worn during the day or evening throughout the warmer seasons. This one is excellent in my view, and although perhaps understated, is not in the least bit bland. I think it's also very versatile, being especially suited to daytime casual, sport, and work use. Overall, I recommend it without hesitation. The new bottle is of the same shape as the original bottle, except that the label listing the contents has been adjusted, plus the color of the liquid and the box are a rich blue. Not very imaginative, but as a marketing effort to create a fragrance family quite logic, especially since the bottle with its black top is timelessly attractive and fits well in the hand. I like it. The scent starts fresh, citric, with precise notes of mandarin and grapefruit which definitely taste fruity without any resemblance to those artificial lemonade aromas. Tart and woody notes follow making a nice contrast, but I could not name any individual trees. A soft tonka and a comfortable understated musk can be found in the base. I like this scent because it combines the current trendy fruit notes with classic woody accords and a cozy warm base. This is not particularly exciting or even interesting, there is no special magic ... this scent is just easy and wearable. Absolutely recommended not only as a fresh, fruity Summer scent but also for cooler days. Know that the sillage is not intrusive but makes a rather relaxed statement. The durability stretches loosely over a whole working day and what I find remarkable is that the head notes do not slacken off but continue on with their fresh and fruity components. The single notes are very balanced and harmonize well together. A trustworthy and agreeable companion during a hard office day. Yes, female co-workers might sniff with some interest, but a "Grrrrr" reaction is not coming. So, the scent does not match - I am sure - the Opel Kadett driver of the 70s. Neither does it go with the edgy explorer types who prefer male, maritime fragrances of past times such as "Old Spice". Rather think of relaxed boaters on Lake Steinhude near Hanover or family weekend pedalo riders on Lake Kesselohe in Munich's English Garden. And, I am quite sure that it fits well with all those colleagues who love a calm and understated scent in the office. "Potion Blue Cadet" is a delightful fragrance promoting a good mood for the whole day, but it certainly is no magic potion ... or love potion. Write the first Review for Potion Blue Cadet!